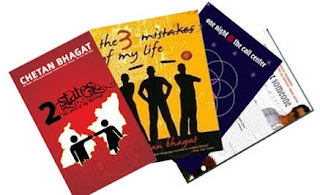 Kiran Hegde's Blog: Chetan Bhagat and his books! Chetan Bhagat and his books! By any remotest chance if you are then the you can find out here that he studied Mechanical Engineering at the Indian Institute Of Technology (IIT) Delhi (1991–1995). He graduated from the Indian Institute of Management (IIM) Ahmedabad (1995–1997). After graduation he worked as an investment banker in Hong Kong. That would be what most such IIT/IIM would be most happy with but Chetan choose a different path to pursue his passion for writing. What are his 4 books like ? 1. Five Point Someone – What not to do at IIT! (2004) – A dark side book on 3 IITians viz Alok, Hari and Ryan who did all sort of not to do things at IIT securing 5 point something grades (which happens to be on lower side on scale of 10). It highlights many issues in the system in India which could be ragging, grading systems which as perceived leaves lesser room for creativity and so on..
Movie - 3 idiots is based on this Novel although story line is considerably different..
Sharman Joshi – Raju Rastogi – Alok – Less confident seeming arising out of familial pressure. Its based on a group of six call center employees working in Connexions call center in Gurgoan, Harayana. Its how these 6 people traverse with their problems, Lot of mention about the cheap office politics, creating taking & too much filmly with the story Narrated by a beautiful girl in Train & the final call from God. Story line has combination of Riots to religionistic fanatism and secularism to Cricket love to Love Story. Quotable Quotes: Life is an optimization problem, with tons of variables and constraints. You can minimise the pissed-off state, but can't make it zero. We can only optimise life, never solve it! Why? – just because they think is to be incorrect/in-appropriate primarily because they didn’t have a say in it..
3. (Not all but definitely many) Families are least bothered about compatibility of the couple rather are most bothered about the increasing number of points they can brag about ! 1. All stories have a dark side, but again in real life as well one goes through dark phases. “Life is not to be taken seriously, as we are really temporary here. We are like a pre-paid card with limited validity. If we are lucky, we may last another 50 years. And 50 years is just 2,500 weekends. Do we really need to get so worked up? It’s ok, bunk a few classes, goof up a few interviews, fall in love. We are people, not programmed devices. I’ve told you three things – reasonable goals, balance and not taking it too seriously that will nurture the spark. However, there are four storms in life that will threaten to completely put out the flame. These must be guarded against. These are disappointment, frustration, unfairness and loneliness of purpose.You cannot avoid them, as like the monsoon they will come into your life at regular intervals. You just need to keep the raincoat handy to not let the spark die.! P.S. I am not affiliated to him in anyways, just like him, kinda follow him, so wrote abt him! Chetan Bhagat cashed upon what he knew he could do bes. Story telling, making a plot out of real life experiences and adding a pint of fiction to them just make his creations a delight to devour. The intimacy, well, it is described in a way that could be a turn on for sure. Chetan has a new book out called "Revolution 2020" which he will show case at the Times Literary Carnival in Mumbai.